Explaining how Berkshire Hathaway chooses companies to invest in, Charlie Munger said: “We pick high quality businesses that we feel are cheap. We then go in hard.” He echoed the view of many value investors, that you’re better off buying quality companies at a fair price than cheap duds. The approach might be called “quality at reasonable price” (QARP), a value investing equivalent to “growth at reasonable price” (GARP), the popular stock picking strategy of growth investors. Quality at a reasonable price is a good way of looking at European companies, which are currently cheap given the quality they offer. European businesses are as old as capitalism itself. Most Euro Stoxx 50 companies are over 100 years old and have survived wars, depressions, and political crises far worse than today’s. We believe the worst of the Eurozone crisis is over, that political risk is overstated and that Eurozone blue chips and the equity market will soon make a recovery. It has been over seven years since the eurozone crash of 2011 and today the landscape is very different. For the past five years, the eurozone’s GDP growth has been one of the strongest in the world, well outstripping the U.S. Jobs have also returned, with eurozone unemployment sitting at roughly 8% today, having trended downward at almost 1% a year since 2013. 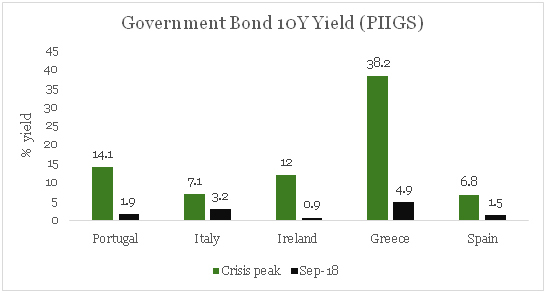 Calm has returned to the bond market and all the PIIGS (Portugal, Ireland, Italy, Greece and Spain) have had their ratings upgraded, with the exception of Italy. Greek debt has seen a remarkable turnaround and is now rated B+ by S&P – up from the deathly SD (default likely) rating it held through 2012. Outside sovereign debt, private debt has improved too. Non-performing loans have fallen off from a peak of almost 10% down to a safer 3%, suggesting European private institutions are more creditworthy too. Eurozone equity recovery however has been slower than bond recovery and the Euro Stoxx 50 has underperformed the other major global indexes by a strong margin on a total return basis. Investor scepticism about the Eurozone’s prospects is captured in valuation metrics, which put European blue chips on a discount compared with their Japanese, Australian, American and even British counterparts. We believe these discounts could constitute a buying opportunity particularly as Eurozone companies are some of the highest quality in the world. The opportunity comes at a time when quality-at-value is harder to come by. Sensible investors always keep an eye on politics and Europe’s elections of late have been somewhat reassuring. Fears of “far-right” governments coming to power appear to have been overblown. Marine Le-Pen, the conservative nationalist, lost the 2017 French election. Worries about neo-Nazis taking the throne in Austria, Sweden and Germany appear premature. How might investors with an interest in Europe play the market? 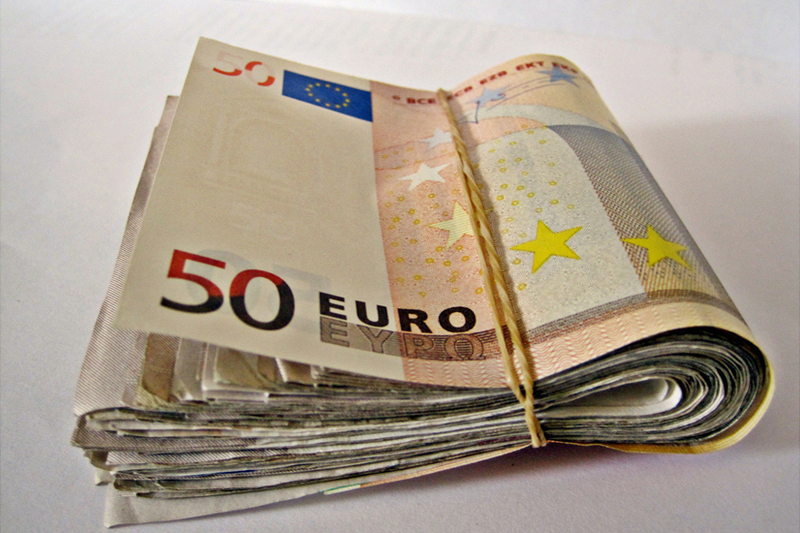 One idea might be to buy the ETFS EURO STOXX 50 ETF (ESTX). ESTX tracks one of the most famous European indexes: The Euro Stoxx 50, which captures the biggest 50 companies in the Eurozone. Most of the companies in the index will be familiar to mum and dad Aussie investors: BMV, Louis Vuitton, L’Oreal – and plenty more. Because the index captures companies in the eurozone – and not Europe as a whole – Britain is left on the sidelines, which is perhaps a useful thing given the uncertainty Brexit is bringing. This document is communicated by ETFS Management (AUS) Limited (Australian Financial Services Licence No: 466778) (“ETFS”). This document may not be reproduced, distributed or published by any recipient for any purpose. Under no circumstances is this document to be used or considered as an offer to sell, or a solicitation of an offer to buy, any securities, investments or other financial instruments and any investments should only be made on the basis of the relevant product disclosure statement which should be considered by any potential investor including any risks identified therein. This document does not take into account your personal needs and financial circumstances. You should seek independent financial, legal, tax and other relevant advice having regard to your particular circumstances. Although we use reasonable efforts to obtain reliable, comprehensive information, we make no representation and give no warranty that it is accurate or complete. Investments in any product issued by ETFS are subject to investment risk, including possible delays in repayment and loss of income and principal invested. Neither ETFS, ETF Securities Limited nor any other member of the ETF Securities Group guarantees the performance of any products issued by ETFS or the repayment of capital or any particular rate of return therefrom. The value or return of an investment will fluctuate and investor may lose some or all of their investment. Past performance is not an indication of future performance.